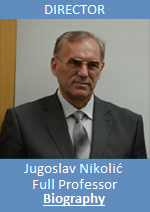 Professor Jugoslav Nikolic graduated in the field of physics – study program: Meteorology, from the former Faculty of Natural Sciences and Mathematics, currently named the Faculty of Physics of the University of Belgrade. He obtained his Master of Science (MSc) and Doctoral (PhD) degrees from the University of Belgrade, Department of Hydrogeology - FMG, all the while working in his profession. Professor Nikolic holds the academic rank of Full Professor. He has a long-term work experience in a highly qualified positions at the Republic Hydrometeorological Service of Serbia (RHMSS) and has achieved results in the research, comprehensive study and integrated solving of problems fundamental from the meteorological perspective – physics of the atmosphere, environmental protection, and application of findings in the energy, water management and agriculture sectors. Through his expert and scientific papers, projects and monographs, he made original expert and scientific contributions and influenced the development of science, scientific thought and the profession. His scientific engagement refers to the Serbian Academy of Sciences and Arts (SASA) and occasional lecturing at the doctoral programs of related faculties. He is a member of the Scientific Board of the SASA’s Geographical Institute “Jovan Cvijic”, and has been appointed a member of the Board for the Dynamic of the Earth's Climate System and the Work of Milutin Milankovic by the SASA’s Executive Board. Professor Nikolic has been awarded with the prize of the Belgrade Chamber of Commerce for the best scientific paper of special significance for application in the economy and relevant expert professions. Professor Jugoslav Nikolic is the Permanent Representative of the Republic of Serbia with the World Meteorological Organization (WMO), the European Organization for the Exploitation of Meteorological Satellites (EUMETSAT) and the European Centre for Medium-Range Weather Forecasts (ECMWF). He was directly engaged in the efforts to obtain a full membership status for the Republic of Serbia in the ECMWF starting from January 1, 2015 and invests significant effort to establish active status for the RHMSS in other international organizations. Professor Nikolic’s area of professional interest relates to geosciences – meteorology, hydrology, hydrogeology and their applications in the fields of environmental protection, energy (renewable energy resources), agricultural meteorology, climate research (climate resources and climate change), and weather modification (hail suppression, drought management – rain stimulation), as well as to the complex research concerning the production of a numerical model for evapotranspiration, of strategic significance for various practical applications: in water management (water balance analysis, planning and control of water resources, irrigation/drainage of the terrain, planning of hydro construction works and objects, production of flood protection structures, production of water management master plans of catchment areas, production of hydrological forecasts, etc. ); in the field of environmental protection; in the agriculture (projects related to melioration); for planning in the electric power industry, road industry, agricultural meteorology and other economy sectors; in the production of weather forecasts and climate studies; and numerous other applications in meteorological, hydrological, hydrogeological, agricultural and environmental practice. By Decision of the Serbian Government, Professor Nikolic has been appointed as the Director of the RHMSS, after winning in an open competition process for this position. The Government has also made him a member of the Republic Emergency Situations Headquarters, the National Council for Climate Change, the National Geospatial Data Infrastructure, and the RHMSS representative in the Negotiation Group on Environment – NG 27. During his considerable career, Professor Nikolic worked, among other things, as a synoptic analyst at RHMSS weather forecast division, a synoptic analyst in aviation, head of RHMSS radar centres, head of RHMSS department of meteorology, head of RHMSS division for aerologic measurements, and an officer for strategies, programmes and projects from the field of meteorology and climate change, within RHMSS department of development and EU programmes and projects. Through his scientific work, using the interdisciplinary approach, he has made numerous practical contributions. He gave his contribution to the field of sustainable development through participation in the production of the Spatial Plan of the Republic of Serbia 2009 - 2013 – 2020, within the section relating to the impacts of natural atmospheric disasters. Professor Nikolic was among the first to research the activity of the natural radioactive gases of radon and thoron using the applicable passive discriminative nuclear track detectors in the air column in the soil. Linking the geological and hydrometeorological/climatological characteristics of certain areas with the intensity of natural radioactivity in those areas represents an original scientific contribution to the production of relevant risk maps. Besides the above, he has also made a significant contribution to the analysis of weather conditions, ozone research, global radiation estimation, as well as to the field of hydrology/hydrochemistry. His scientific publications include three scientific monographs and a number of papers published in international journals indexed in the Science Citation Index (SCI), and in international conference proceedings. Professor Nikolic is the author of two outstanding monographs of national and wider significance, both published by the SASA’s Geographical Institute “Jovan Cvijic” and launched at an event organized by SASA on 5 February 2011, which was attended by numerous academicians, representatives of faculties, scientific institutes and RHMSS. Recently, Professor Nikolic has published 12 papers of M20 category (papers published in international journals), 6 papers of M51 category (papers published in leading journals of national significance), and over 40 papers of M33 category (papers presented in international conferences printed in full). The results of his scientific and expert work, inter alia, have found practical application in the harmonization of the monitoring of the atmosphere, hydrosphere and lithosphere characteristics, through harmonized organization of meteorological, hydrological and hydrogeological monitoring in RHMSS, which also represents a significant contribution to the profession. Professor Jugoslav Nikolic has managed or participated in the implementation of numerous scientific projects. He is a member of the Editing Board of the scientific journal “Zbornik radova” of the SASA’s Institute “Jovan Cvijic”. His relevant experience, scientific and academic activity, following of global research processes, and membership in respectable expert and scientific associations, equip him with competence and confirm his status as a creative and authoritative expert whose work significantly improved conventional expert and scientific models.